So you want to create a Backup of your Blogger Template. It is very necessary to keep a Backup. In this post I will show you how to Backup and Restore a Blogger Template in a very easy awy. Hey! Welcome to this Basic Blogger Tricks post. In this post I will make you learn how to create a Backup of your Blogger Template. I know many of you were knowing how to do this. In most cases people thinks that it isn't necessary to keep a Backup of their Blogger Template but they are completely wrong. It is always very necessary to keep a backup which you can use in emergency. Let say you started Customizing your Template and after customization you saved your Template but what if after saving you got some errors in your Blogger Template which you are not able solve. Than in that case you can use your Backup of template. Now I think that you have understand how it is very necessary to always keep a Backup with you and stay one step away. Now see the very easy steps given below to create a Backup of your Blogger Template. At First you will need to sign in to your Blogger Account if aren't signed in now. After signing in click on he Blog title on Home Page of which you want to make a Backup. Now go to Template from the Dashboard. Now in the Template page click on the Backup/Restore which is located in the top right corner of the Template page. After clicking Backup/Restore you will see a menu is appeared. In that menu click orange Download Button to Download your current applied Blogger Template. Great! You have just created a Backup of your Blogger Template. Tip: Always try to preview your Template after any customization and after preview if you don't find any errors in your Template than Save your Template. Now you have learnt how to make a Backup of your Blogger Template but I haven't told you how to Restore the Template from your Backup. It is very much easy to restore from a Backup Blogger Template. 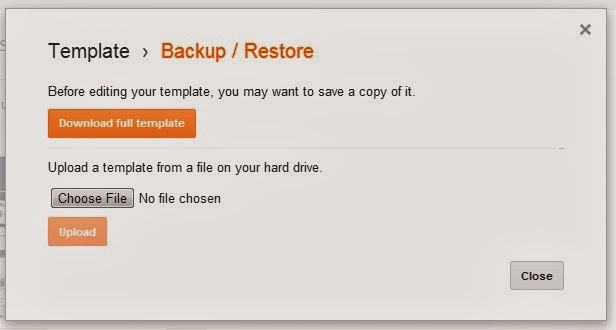 Follow the steps given below to know how to restore your Template from your Backup Template. To Restore your Blogger Template from a Backup Template go to Blogger Home > Dashboard > Template. 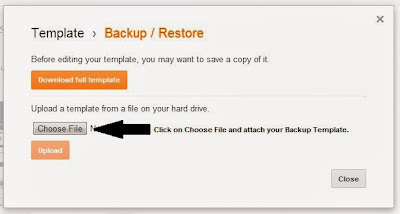 In the Template page you have to click on Backup/Restore which is located near the top right corner of Blogger Template page. Now after that a menu will appear. Click on choose file from that menu and than add the attach the Backup file which you have downloaded. After that you have to click on Upload Button. Wait a while till the uploading of your template get finished. After the upload finishes go to your Blog again. Now you will see everything is working fine like your Previous Blogger Template. That's It! You have learned how to Restore your Blogger Template from a Backup file. That's All! You have learned how to create/make a Backup of your Blogger Template and to Restore a Template from a Backup Template. Isn't this very much easier than you thought it would be to create a Backup of a Blogger Template. And Restoring of a Blogger is also too easy. Actually I think Blogger is the simplest Blogging platform which provides very much features in simple to use user interace. You will not need to learn any programming to start Blogging with this Blogging platform. And it is quite good Blogger platform for developers and programmers too. You can make your blog in the way want it to appear. You would also like our latest Blogger Tips and Tricks. Go to Blogger Tricks from the navigation menu and start exploring some very interesting Blogger Tricks. You would also like to check out our latest Free Blogger Templates list. I hope this post provided you all necessary information that you are looking in this post. If you are facing any type of problem that feel free to ask me.